In this adventurous and lyrical recording for children and families we are taken by the hand and led into a fairyland which is deeply rooted in the real life stories and songs that are a part of our multi-faceted American cultural tradition. 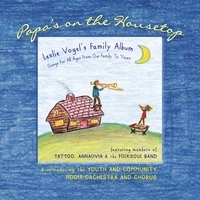 Drawing from a musical heritage that includes classical, Irish, Appalachian and New Orleans genres, Leslie Vogel has gathered her own considerable creative forces and combined them with the many talents of highly skilled musician friends and family members to bring out this remarkable collection of original and traditional songs. First off, this album is not "children's music"; though the atmosphere throughout is gentle and deeply evocative of a past full of legend and myth, there is a subtlety in the lyrics, arrangements, and melodies that is the product of years of musical experience. One of the remarkable characteristics of this collection is its ability to defy categorization but still draw the listener in with a compelling impression that they've known these songs forever; the other is the way in which these richly layered performances still sound light and open. You will be happily surprised and satisfied by what you find here.